“There is nothing more whole than a broken heart, ..."
FINDING MY RELIGION Teacher of Jewish mysticism talks about the High Holidays, forgiveness and imperfection. “Estelle Frankel’s Sacred Therapy is a groundbreaking book in the new field of Spiritual Guidance. She explains the major concepts in Kabbalistic mysticism and creatively applies them to one’s life; she also includes many examples from her own psychotherapy practice. This is a book for professionals and those studying to learn these concepts and to apply them to their daily life. It extends and updates the historical concepts laid out by Rabbi Zalman Schachter-Shalomi. Frankel’s meditative exercises allow the reader to experience the esoteric elements personally. 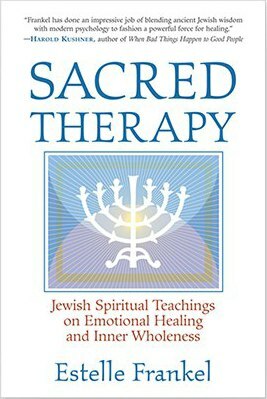 “Sacred Therapy, Estelle Frankel’s newly published book on healing from a Jewish perspective, is warm, well-written and inspirational, but it’s not necessarily suggestive of an easy path. Reading Sacred Therapy immediately evokes in the reader primary difficulties: losses, deaths, broken-heart moments, grief, disillusionment. I especially thought of profound empathic breaks that have occurred within my own relational world -- in my psychotherapeutic work, in my daily life-flow, in my own character and spiritual development, in integrating the lows and highs of conscious, collective experience (organizational, marital, extended-family) relative to ideals and in my often ambivalent relationship with G-d. Such existential problems of living gain a spiritual, mytho-poetic context in Frankel’s alchemy of Kabbalistic teachings and psychological nuance. Frankel accomplishes this with personal, experiential illustrations; examples from her therapeutic encounters; pleasant prose; a poetic sensibility; and elucidations of ancient mystical wisdom embodied in and culled from Jewish myths. Her generous seasonings of Chassidic legends illuminate her insightful interpretations of Torah teachings and Midrashic wisdom. She provides contexts of “sacred embrace”, a transformative crucible for re-contextualizing our very human suffering patterns. Frankel’s book offers empathy, meaning and purpose to our struggles with challenging life-processes; inevitable losses, betrayals and heartbreaks in life are held with honor as essential to the fabric of our humanity and our own psycho-spiritual growth. Well-written and clearly organized, we journey, under Frankel’s humble yet keen guidance, through our own and others’ broken places and wounds. We are connected, as it were, to ancient human sufferings in a process that engenders humility, compassion and a healing sensibility, essential qualities in an effective therapeutic response. We are invited to honor our and others’ wounds, depressive moods and life struggles, by culling and “extracting the meaning” from them. Frankel skillfully brings our attention to the integration of brokenness and wholeness. When empathy flows, there is an engagement, an involvement, an “I-Thou” exchange that is inherently whole and healing. Conversely, “empathic breaks“ are painful misses, shatterings of the wholeness and unity we long to have and sustain. Spiritual crises, loss of faith, betrayals, trauma - can be terrifying separations from our ground of being engendering blame, self-doubt, mistrust and paranoia. It is this Frankel addresses. Frankel reassures us throughout of the healing power inherent in our suffering. An initiation is often necessary for spiritual growth. “God created a flawed universe in order to give every creature a role in its restoration.” Tikkun, or repair, can then come about through a re-engendering of empathy between g-d and people, a re-collecting and re-constructing of the pieces into a “mosaic”, a synthesis of gathering profound meaning and direction from the imperfect. One such transformative initiation in my life was the break-up of a communal housing project in the Santa Cruz mountains. On the heals of an idealistic collective vision came the realities of years of challenging hardship and ultimate failure. Accompanying the ordeal of this collective calamity was the painful dissolving of friendships between two families whom had grown very close through the years. These families, like a poorly divorcing couple, were not able to manage the inevitable differences that arise in human relations and accomplish a clean break; rather, the project devolved into an ugly battle, with both parties feeling offended, betrayed and wounded. The pain of an intimate betrayal and loss can be severe and intense: blame of self and other; maligning of character; alienation and a sense of “cut-off” from what is beautiful, good and nurturing; ongoing financial and legal stress; community discontinuity. The process of such a transformative “long, dark night of the soul” can be a lonely period of Ayn, of emptiness, sorrow and grief; and the beginnings of recovery. Teshuvah work, “holy aloneness”, is difficult, compelling, transformative work; when the impact of one’s choices and actions are felt to be “unforgivable” by the other. Nonetheless, such personal work can result in shifting of consciousness and reconciliation desires began to emerge. I have had to struggle through such an alchemical process to reclaim my integrity and purpose after the damage of our Santa Cruz bust. What has burst through for me is a sense of a greater resilience within that I had previously known. A sense of forgiveness and of acceptance, a spirit of love and reconciliation, a redemptive longing and intensity has emerged as a clear prism, a healing gift from the ashes of destruction. It is akin to the greatest loss of my parents’ lives, similar to the legacy Frankel has had to transmute -- the traumatic devastations of the Holocaust. Survival from such traumatic ordeals, when skillfully processed and integrated from a psychologically grounded and spiritually centered perspective, can engender tremendous compassion, humbly connecting us with the entirety of the human condition; liberation, as with my father’s release from Buchenwald, is akin to the Exodus from Egypt and is thereby suggestive of ultimate human redemption. One travels through Frankel’s book slowly, chewing on the ideas, myths and stories and digesting the insights and teachings in a moment to moment way. – Michael Gelbart, LCSW, San Leandro, Ca. An hour-long program on the High Holidays. This CD was originally produced as a special holiday program for KPFA radio, by Russ Jennings at Common Soul Productions. A 2-hour course on Jewish healing taught by Estelle. Available for purchase through Chochmat Halev’s Jewish Healing Program. 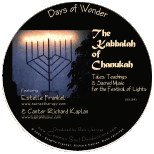 Download the Podcast version of Kabbalah of Chanukah (mp3, 51.2mb).